We put these hires through the theory of relativity. We’ll do it on a 10-point scale, with 10 being the best possible hire, and 1 being the worst possible hire. 10 – Jeff Fisher, Rams – In an offseason where many big names circulated around the coaching carousel, Fisher is the one who actually landed. The former Titans coach provided stability for an organization that didn’t really have it otherwise in Tennessee, and the results were 142 wins, six playoff appearances, and one AFC championship over 17 years. Fisher never had elite talent, but he always had a physical team that played good defense and ran the ball well. And when he got a quarterback with toughness – as with the late Steve McNair – he won. Now he goes to St. Louis, where he becomes the seventh coach (including interims) since 2005. The Rams desperately need stability, and Fisher brings that. He should help a defense with nice, young front seven pieces play better, and he will set about fixing an offensive line that has struggled despite massive investment in the draft and in free agency. Most of all, his job is to develop a system that allows promising young QB Sam Bradford to prosper. (We covered what Fisher’s arrival means to RB Steven Jackson previously in this post.) Fisher may not be a Hall of Fame level coach, but he is a good one, and he should help in St. Louis. 7 – Chuck Pagano, Colts – I don’t know why I have such a good feeling about the fit of Pagano and the Colts. 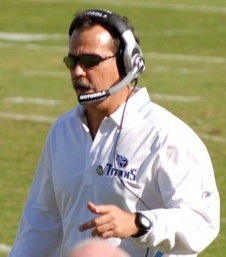 Pagano’s NFL resume isn’t that long – he has spent most of his coaching career in college – and he served as a coordinator for just one year at the NFL level. But his Ravens defense was solid this season, and he certainly had plenty of big personalities to contend with in Baltimore. Now this coaching lifer – who has also been a secondary coach in Cleveland and Oakland – leaps to the big job. When he has been in the media, he has showed personality, and all reports say he was hyper-prepared for his Colts interview. The one potential glitch in this mix is how Pagano will develop a young quarterback – either Andrew Luck or Robert Griffin III – coming in as a rookie. Undoubtedly, the Colts asked that question in the interview, and they must have liked Pagano’s answer. And stepping into a situation with a franchise quarterback coming in off the bat is good fortune for Pagano. Plus, the recent history of Ravens defensive coordinators to become head coaches (Marvin Lewis, Rex Ryan for example) is pretty good. His staff will be key, but the early returns on Pagano and the Colts seem very promising. 6 – Mike Mularkey, Jaguars – We discussed the reasons behind hiring Mularkey and what his biggest job in Jacksonville is in this post. We like the move even more now that he has kept Mel Tucker around as defensive coordinator. Ultimately, we like this move more than most second-time coaches. Mularkey is still a good prospect and a worthwhile hire. 5 – Dennis Allen, Raiders – The Raiders, who were widely assumed to be importing a Packers assistant now that Reggie McKenzie is the GM, instead hired Broncos defensive coordinator Allen. Allen doesn’t have a long resume, but he did a nice job with the Denver defense this year after a few years as the Saints secondary coach. The fact that Allen was hired off John Fox’s staff could be a good precedent; a similar thing happened when Jacksonville plucked defensive coordinator Jack Del Rio off Fox’s staff after his first year in Carolina. Allen is just 39, but he’s obviously a sharp coach, and former players have credited his people skills as well. But the Raiders’ culture isn’t necessarily one bred for success at this point. There is a commitment to excellence, but there isn’t a commitment to the things excellence requires – like discipline, shrewd salary-cap management, and more. McKenzie will start trying to fix those things, but the question is whether being the first coach in the rebuilding process is ideal. Still, Allen inherits a talented roster, and he knows the AFC West. He needs to find a strong offensive voice, but that could still happen. So he has a real shot in his first head-coaching job – which isn’t a bad situation at age 39. 4 – Greg Schiano, Buccaneers – The Buccaneers, apparently entranced by Jim Harbaugh’s first-season success, first chased Oregon’s Chip Kelly before landing Schiano from Rutgers. Schiano did a remarkable job of taking Rutgers from being the dregs of college football to being respectable, although he couldn’t take the final step to a BCS bowl out of the Big East. Still, he has a solid resume that includes NFL experience as a defensive backs coach with the Bears. He is well respected, and Bill Belichick’s public respect undoubtedly helped Schiano land the job in Tampa Bay. Now he must show that he can coach, not just recruit. The Bucs have a young roster, and the fact that Tampa Bay has taken a lot of gambles on talented players with questionable character certainly contributed to the 10-game losing streak that cost Raheem Morris his job. Schiano must make the team tougher as he develops the skills of guys like QB Josh Freeman, DE Adrian Clayborn, and MLB Mason Foster. That means Schiano’s staff will be of paramount importance. We never love the idea of college coaches going to the pros, and a coach who made his bones as a recruiter the way Schiano did is even more of a question mark. But if Schiano can add toughness, the talent is present for Tampa Bay to tick up quickly. 3 – Joe Philbin, Dolphins – Philbin, who spent his entire NFL coaching career with the Packers after joining the team in 2003, was an under-the-radar selection who gained serious momentum with the Packers’ offensive explosion this season. Everyone who has worked with Philbin speaks highly of him, both as a strategist and in terms of working with people. If that’s the case, then he could end up being a fine selection. But he represents a departure from the offensive system the Dolphins were using, and a transition to the West Coast offense could lead the team downward before it surges. Plus, owner Stephen Ross really wanted a high-profile hire – he chased Jim Harbaugh and Jeff Fisher the last two offseasons – so it’s hard to imagine how much rope Philbin will get in Miami. Philbin’s a good head-coaching candidate, but this is a strange place for him to land. 1 – Romeo Crennel, Chiefs – We discussed why the Crennel hire is a bad idea in this post. It’s back, folks. One of our silliest yet most entertaining features – the Crazy Kicker of the Week. Here are last year’s winners. This year, our first winner is PK Josh Brown of the St. Louis Rams. At the end of the first half of the preseason opener against the Indianapolis Colts, Brown ran onto the field to try a 60-yard field goal before getting the go-ahead from head coach Steve Spagnuolo. Good thing, because Brown drilled the 60-yarder. Plaxico Burress will be released from prison Monday, and with that backdrop we want to consider Burress’ future NFL home in the latest edition of Finding a Fit. This is the fifth edition in a series that will continue as long as the lockout drags on. In this series, we’re going to look at free agents and try to match them to their perfect fits. We’ll consider opportunity, skill specificity, personality, and even money as we do this. Previous Finding a Fit features focused on Matt Hasselbeck, Nnamdi Asomugha, Ray Edwards, and Aubrayo Franklin. Click through to check those out, and if you’d like to suggest a player for finding a fit, leave a comment or let us know on Twitter. Burress was once a true No. 1 receiver, both with the Steelers and the Giants. He is a long, lanky target who can get downfield and make the big play. Plus, he’s proven he is clutch, with his game-winning touchdown in Super Bowl 42 as proof. But for the last two years, Burress has been in prison because of a weapons charge in which he shot himself in the leg with a concealed gun in a night club. Now he’ll try to make an NFL return at age 33 and reclaim his career, which has featured 505 catches for 7.845 yards and 55 TDs. N.Y. Giants – It seems as though the door is closed on a Burress return to the Giants. Former teammate Brandon Jacobs said as much in an interview last week. It makes sense for Burress to want a new start, and the Giants have a deep receiving corps with Hakeem Nicks, Steve Smith, Mario Manningham, and Burress-sized prospect Ramses Barden. It makes the most sense for both teams to move on. N.Y. Jets – If Burress wants to stay in the Big Apple, the Jets could be an option, especially if free agents-to-be Santonio Holmes, Braylon Edwards, and Brad Smith leave. But it appears that Burress would be a fallback option at best for the Jets, which is probably not the situation he’s looking for. Philadelphia – Burress has made it known that he’d love to land with the Eagles, in large part because of the team’s success resurrecting Michael Vick’s career. But while the connection makes sense from an off-field perspective, on the field Burress doesn’t fit. The Eagles have a great young receiving corps in DeSean Jackson, Jeremy Maclin, Jason Avant, and Riley Cooper. There’s simply no room for Burress to take up a roster spot. St. Louis – Burress and Rams head coach Steve Spagnuolo were in New York at the same time, and that connection could lead to a chance for Burress. QB Sam Bradford has a ton of young targets, but aside from Mark Clayton (and maybe Danny Amendola at this point), none are proven. Taking a low-cost shot at Burress makes sense, and few teams offer Burress more playing-time opportunity than the Rams. Washington – The Redskins are receiver-poor, with only smallish Anthony Armstrong established as a solid option. So they will need to add a receiver in free agency, and Burress could offer depth or even backup in case higher-profile, higher-priced targets stay away. This situation bears watching. Pittsburgh – The Steelers originally drafted Burress, but they let him leave via free agency because his off-field demeanor seemed to limit his talents. (The same thing happened with Santonio Holmes a few years later.) Reports indicate that Pittsburgh may consider a Burress return, but with Hines Ward still ensconsed and youngsters Mike Wallace, Emmanuel Sanders, and Antonio Brown emerging, the luxury of having Burress wouldn’t be worth the baggage of the past for the Steelers. Cleveland – The Browns have a cadre of promising young receivers led by Mohammed Massaquoi and rookie Greg Little, but they don’t have a veteran go-to guy. So Burress makes sense from an on-field perspective. But Burress’ skills don’t necessarily match up with Colt McCoy’s best traits, and the Browns are rebuilding so much that Burress could be a distraction. So unless the opportunity is a low-cost flier, it’s hard to see the Browns being the ones to take the plunge in this market. Chicago – The Bears don’t have a high-profile receiver, although youngsters Johnny Knox, Earl Bennett, and Devin Hester. Burress would add a tall receiver and a red-zone threat, but is he precise enough in his route-running to play for Mike Martz? It’s hard to see Burress jumping into such a complicated system in a lockout-shortened season. Oakland – The Raiders always end up on lists of homes for lost souls, and their receiving corps has promise in Louis Murphy, Jacoby Ford, and first-round bust-so-far Darrius Heyward-Bey. If no contender steps up, the Raiders could end up being Burress’ best option in terms of playing-time possibilities. This is a possibility that can’t be ruled out. 1. St. Louis – It would be a bit out of character for the Rams to take a chance on a veteran like Burress, but he would provide a safety net for a young group of receivers, and he could be the difference between an NFC West title at 8-8 or 9-7 and another 7-9 season. Plus, the Giants ties with Spagnuolo add a comfort level. 2. Washington – If Burress wants to prove to the Giants that he can still play, Washington is the place he would get the most chance to play. The Redskins added a bunch of old receivers last year, but aside from Joey Galloway, none even made a regular-season catch. With Santana Moss facing free agency, Burress may provide a bit of security and a bit of leverage for the Redskins. 3. Oakland – The Raiders don’t have a strong need for Burress, but taking a shot on a veteran fits Al Davis’ history. This option makes less sense, but we get a nagging suspicion that Oakland is going to be a player in this market.